to teach preschool and kinderschool classes from April 2019. Convenient location, next to train station. Less than 30 minutes by train from Ikebukuro, Shinjuku and Shibuya areas. Teach a group of children, helping them develop into young adults while following our preschool curriculum. Any nationality is welcome! An English speaking teacher who is living in Japan. Teaching experience, enthusiasm, reliability, someone who already holds a visa. Basic Japanese knowledge with a japanese spause visa preferable. More than one year of commitment is necessary. Able to work in a team and at times alone. *If you are interested in the position, please contact us through the inquiry form. Convenient location, next to the train station. 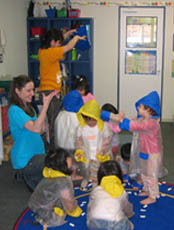 You would teach a group of children, helping them develop into young adults while following our preschool curriculum. Native English teacher who is already living in Japan; must hold a visa. Great personality, reliable and enthusiastic about working with kids. More than one year of commitment is necessary. Able to work in a team and at times alone.